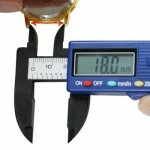 Whether your watch crown is broken or you simply want to exchange it for a larger one that is easier to turn, before you can replace it you will need to measure the size of the crown. Use this guide to learn how to measure a dustproof watch crown. You can tell that your watch crown is a dustproof one by checking on the watch case for a stamp of “water resistant” or “waterproof”. Watches without this marking will have a dustproof crown. These watch crowns will also be lacking the case tubes you see on watch cases with waterproof crowns. But since case tubes can fall out of waterproof watches, you should always check the watch case to see if it is marked as water resistant or waterproof as well. The first thing you will need to do is remove the old watch crown. 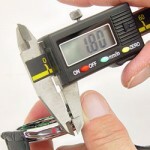 To learn how to remove your watch crown, you can check out this link. Once the old dustproof crown is free of the watch case, lay it out in front of you on your work bench. 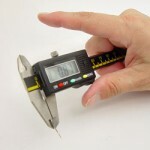 You will start by taking your digital gauge and using it to measure the outside diameter of the old crown. 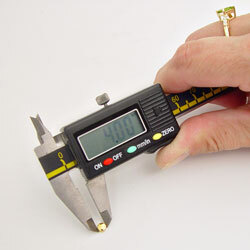 Open the jaws of the digital gauge wider than the size of the crown and position the jaws on either side of crown. Then close the jaws until the rest snugly against the edges of the crown. Record the measurement. This will give you the size of the crown you will need to order. Once you have removed the stem of the watch, take your digital gauge and use it to measure the outside diameter at the threaded end portion of the stem. 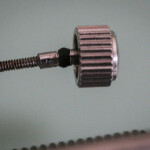 Again, close the jaws around the end of the watch stem until they grip the metal closely. If the stem has been damaged and you cannot measure the threaded portion, you can use the movement number on the movement itself to look up the correct size stem and tap for the watch. Record the measurement of the tap size. Note: sometimes the tap size is not always listed in millimeters, to convert your millimeter measurement to the correct tap size, check out this conversion chart. 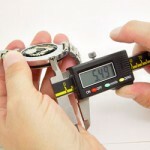 Once you have all three measurements in hand you are ready to order your new dustproof watch crown. All you have left to do is decide if you want a white or yellow crown to match your watch case, and if you want the crown to be flat or domed. 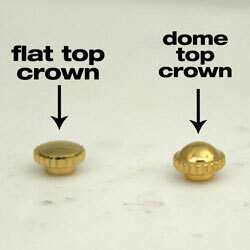 With all your measurements and styles in mind, you can order your new watch crown here! Or, to learn more about removing, replacing, or measuring watch crowns, visit our Learning Center today!